EUFAULA, AL. (10/21/15) – On the heels of HELIX® 5 and the ICAST 2015 “Best of Electronics” award-winning HELIX® 7, Humminbird brings anglers and boaters new supersized HELIX® units with unprecedented functionality. Please welcome HELIX 9, HELIX 10 and HELIX 12 CHIRP. The big brothers of the compact-format HELIX 5 and 7, the new HELIX 9, HELIX 10, and HELIX 12 CHIRP bring an eye-popping 1500 nits of widescreen brightness to your boat, making them easily readable in direct sunlight – even when wearing sunglasses. “One of the most common requests by anglers is to be able to see the screen better and we’ve answered their call,” said Jeff Kolodzinski, Humminbird Brand Manager. But that’s not where their powerful performance stops. The HELIX 9, 10, and 12 CHIRP offer the full range of Humminbird Imaging technologies like patented Side Imaging®, Down Imaging® and 360 Imaging® compatibility making fish-finding a lot more about the finding. One of the biggest HELIX advancements is that the new models are Ethernet capable, allowing them to share waypoints and SONAR across the network. “You want to have a unit right where you fish, so it’s really an advantage to be able to run more than one unit on the boat while sharing data across the network,” Kolodzinski continued. Many anglers have one on the console and one on the bow. Anglers can now see the same waypoints, SONAR and other data on both units and be in the know, wherever they are in the boat. Ethernet networking also brings compatibility with Minn Kota® iPilot® Link™ for the ultimate in boat positioning and fishing navigation. Even better, anglers can now go where no map has ever been with one-of-a-kind, patent-pending AutoChart® Live technology, which allows anglers to make their own maps in real-time, no PC, server or Cloud connection required. Internal memory will store up to 8 hours of mapping data, or add an optional ZeroLine SD card for years of recording and the ability to share map data with a buddy. And when it comes to getting around on your favorite waters, all are LakeMaster compatible with new PLUS map cards with aerial image overlay. Anglers will continue to enjoy the patented Humminbird LakeMaster benefits of Water Level Offset, Shallow Water Highlight and Depth Highlight. The HELIX 12 CHIRP boasts all the aforementioned attributes of the HELIX 9 and 10, but make no mistake about it, this is the head of the family. The 12.1 inch widescreen display is large and in charge and is fortified with built-in CHIRP SONAR technology. The HELIX 12 CHIRP uses long transmit pulses that sweep across bandwidths of frequencies that are then processed using advanced Digital Signal Processing (DSP) to result in high-resolution SONAR with increased target separation and reduced noise. Enhanced target separation allows anglers to clearly identify game fish and baitfish, while reduced noise offers clear, sharp SONAR images. The pulses used by the HELIX 12 CHIRP sonar along with the advanced Digital Signal Processing also allow it to obtain deeper depths while maintaining optimal resolution. Not all forms of CHIRP are created equal. Some CHIRP products only allow the angler to utilize a pre-defined frequency bandwidth. In addition to providing pre-defined frequency bandwidths, the HELIX 12 CHIRP also allows the user to select multiple bandwidth settings to fully customize the SONAR to their unique preferences and fishing applications. Humminbird’s HELIX 12 CHIRP also works with a wide variety of optional transducers, and it is capable of CHIRP’ing through frequencies ranging from 28 kHz to 540 kHz. Aaron Martens likes to run. Some days, he’d probably much rather run than fish. He runs in the offseason to prepare for the Elite Series season. Half marathons, long-distance relays, he’ll compete in pretty much anything where running’s involved. He runs during the season to stay healthy and clear his mind after a day on the water. This season, he ran away from literally every one of his Elite Series competitors. It. Wasn’t. Even. Close. With victories at Lake Havasu and Chesapeake Bay along with five other Top-15 finishes, he compiled the most impressive statistical season in the 10 years the Elite Series has served as B.A.S.S.’s top tournament circuit. There were 35 Elite Series competition days this season. Martens competed on 31 of them, an 88 percent participation rate, en route to his third career Angler of the Year Championship. On 13 of those days, he either was in the lead or was within 5 pounds of the leader. He went to the season-ending AOY Championship at Sturgeon Bay last week knowing he could’ve stayed on shore for the whole event and still won AOY, but he finished 28th and tacked on 10 more points to the gap between himself and his closest challenger. His 112-point margin of victory over Justin Lucas is, by far, the most lopsided AOY win in the four seasons B.A.S.S. has used its current points system. Each of the previous three AOY races was decided by fewer than 15 points. Martens went over the $3 million mark in career B.A.S.S. winnings this season and is now one of eight pros with at least three AOY titles to his credit. The others are: Roland Martin (9 – all B.A.S.S. ), Kevin VanDam (8 – 7 B.A.S.S., 1 FLW), Bill Dance (3 – all B.A.S.S. ), Mark Davis (3 – all B.A.S.S. ), David Dudley (3 – all FLW), Clark Wendlandt (3 – all FLW), Jay Yelas (3 – 2 FLW, 1 B.A.S.S.). He feels that his physical fitness allows him to be sharper on the water and that’s why he’s made such a commitment to eating right and staying fit. He called this season the most consistent of his career and that avoiding the mishaps, be it mechanical or otherwise, that can derail a day or tournament was a big reason for that. Martens’ season started with a surprising sponsor move and a crushing personal loss, but he seemed to navigate it all with ease. In January, Japanese tackle company Megabass announced its 17-year run as one of Martens’ core sponsors was ending as Martens had signed on with start-up rod company Enigma Fishing, headed by friend Jesse Tacorante. It was a bold move that wound up paying off in a big way. Then, on the eve of the Bassmaster Classic at Lake Hartwell, Martens’ father, Jerry, passed away at the age of 75 after a long battle with peripheral neuropathy, a nerve disease. Despite catching a 6-11 brute on day 2 – it was big fish of the event – Martens finished 30th at Hartwell, his worst Classic result since the Louisiana Delta in 2001. Asked how his father’s death impacted his focus heading into the season, he said, “I don’t know. I think of him quite a bit. I don’t know how it helped me, but I don’t think it hurt me obviously. During his run to the 2013 AOY title, Martens had to overcome an 85th-place finish at the Sabine River. It was a venue very few in the Elite Series field had been to or even heard of. When it showed up again on this year’s schedule, Martens vowed that history would not repeat itself. He spent 3 days in east Texas last December trying to learn more about it so he was better prepared when the season kicked off there in early March. Did it ever. He was in 2nd after day 3 and wound up finishing 3rd while fishing the same stretch as winner Chris Lane and 7th-place finisher Shaw Grigsby. Three weeks later, he took 66th at Guntersville, a surprisingly low finish for the Alabama resident who won at the prolific Tennessee River impoundment in 2009. “I just missed them,” he said. “I got on them good in practice. I wasn’t getting a lot of bites, but they were quality bites. It all died, though, in the tournament. The fish moved up and I couldn’t find the females. I was around some of them and I probably needed to upsize my bait. I caught a lot of 2 1/2-pound males. Martens’ season really started to take shape on the West Coast swing, the Elite Series’ first trip to the Pacific time zone since 2010. He was the day-2 leader at the Sacramento River and eventually took 2nd to Justin Lucas before capturing the victory at Lake Havasu the following week. It was a special trip for Martens, whose mom, Carol, a prolific angler herself and the one credited with teaching Aaron how to fish, tagged along for both tournaments. The win at Havasu came at a time when Martens was starting to wonder if he’d ever win again. The Sacramento River was his sixth career runner-up finish in an Elite Series tournament (that’s not counting his four Classic runner-up finishes). 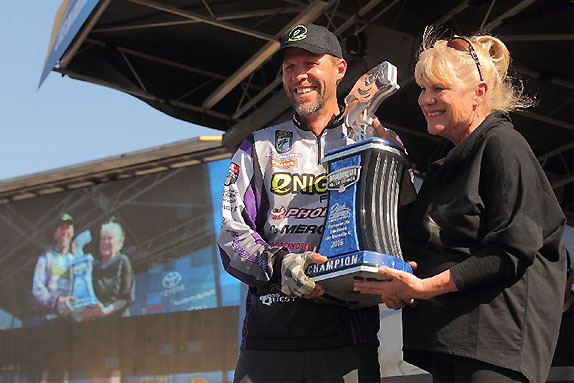 Havasu ranks as one of Martens’ favorite places to fish and he overcame a 2 1/2-pound deficit on the final day to win by 2 pounds on Mother’s Day with his mom in the crowd. The win pulled Martens into 3rd place in the AOY standings, 23 points behind leader Dean Rojas, at the midway point of the season. Martens kicked off the second half of the season with a 15th-place finish at BASSFest at Kentucky Lake, then followed up with a 13th at the St. Lawrence River to take over the points lead from Rojas. From there, he shifted into hyper drive and left everyone else in his dust. Martens called this fish catch – 7-02 giant – at Chesapeake Bay one of the best catches of his career. The highlight of a season full of them came on the final day at the Chesapeake Bay, when he caught a 7-02 kicker from under a snag-infested dock with a spinnerbait. The hook came loose just as Martens lipped the fish, adding to the intensity. The fish catch was captured during B.A.S.S.’ live streaming coverage online and featured Martens apologizing to Bill Lowen for likely spoiling his first Elite Series win. “The first big one out of the reeds at Havasu on the final day was an enjoyable fish for me,” he said, “but it’s not going to top that 7-pounder. It wasn’t hooked in the skin. I had it hooked in the mouth and when it came up I could see the whole bend of the hook. That’s the first thing I look for when I see a fish. I knew it was bad. I expected it it to come off at that point. I tried to keep the rod straight up and the tip bent as much as I could. It propelled him to the victory and he then sealed the AOY title with a 6th-place finish at Lake St. Clair two weeks later. With all he’s already accomplished in his career, Martens is fast climbing the list of best bass anglers of his generation. Still, there’s one hole on his résumé he’d like to fill – and soon. He said he’ll go into the 2016 Classic at Grand Lake with as much confidence as he’s ever had, a scary proposition for his competitors. He finished 28th at the 2013 Classic at Grand Lake. As I write this, I’m preparing for the Toyota Bassmaster Angler of the Year (AOY) Championship on Sturgeon Bay out of Door County, Wis. This tournament presents a lot of firsts for me, and it’s tough to figure out just how to approach it. photo by Seigo Saito – With my mom (Carol) after winning the Lake Havasu Elite Series tournament. Angler of the Year. I was fortunate enough to lock up that title at the end of our last regular season Elite Series tournament on Lake St. Clair. I’ve really been blessed this year, worked extremely hard and have had a lot of success. To win my third AOY title means a lot to me and my family. We’re really grateful. I have a lot of people to thank for this season, and I want to do that soon but with the AOY Championship this week, I thought it would be a good idea to talk about that. I’ll have time to tell you all about my year after the season is over. It’s been a real rollercoaster — some of the highest highs of my career and some of the lowest lows of my life. This tournament is unusual for me because for the first time I have nothing at stake. Since I already earned AOY and the prize money that goes with it, I get the same reward whether I finish first at Sturgeon Bay or last. That’s definitely different. Although there’s nothing really at stake for me, there’s a lot at stake for most of the other guys. They’ll be battling for spots in the 2016 GEICO Bassmaster Classic on Grand Lake O’ the Cherokees and for a greater share of the AOY money. Some of them are already guaranteed a spot in the Classic, but everyone but me can move up or down in the AOY standings and gain or lose money. Even though there’s no way for me to move up or down or change my payout, I want everyone to know that I’m taking the tournament very seriously. I’m trying to do everything right in my preparation. My gear is as well prepared as for any Elite tournament, and I really want to win, collect another trophy and add another page to what’s been a great season. I’ve been fun fishing at Sturgeon Bay a couple of times before, so I feel like I know it pretty well. It’s an amazing fishery with giant smallmouth bass. As a smallmouth fishery, it’s really tough to beat, and I’m really excited to be here. At last year’s AOY Championship at Bay de Noc out of Escanaba, Mich., we ran into some windy weather that kept us off the water for three straight days. Now it looks like conditions could be rough at Sturgeon Bay for part of the practice period. It doesn’t take a lot of wind to create 4- and 5-foot waves out there. If things settle down, though, you’re going to see some fantastic catches. I hope I’m one of the guys making them! But if weather’s a big factor and things are rough out on the big water, I might play things safe because of my situation. Like I said, there’s not much for me to gain or lose. I want to try to have fun, to fish relaxed and to win if I get the chance. But if things get rough, I probably won’t be out there in the middle of it like the guys fighting for one of the last Classic spots. It’s a weird situation, but I think that’s the best way to handle it. Of course, after each day of competition, I’ll be reconsidering my situation and coming up with a new plan. That approach has worked all year. I see no reason to change it now. For the first time in the 14-year history of the BassFan World Rankings, Aaron Martens has ascended to the top slot. He moves into the No. 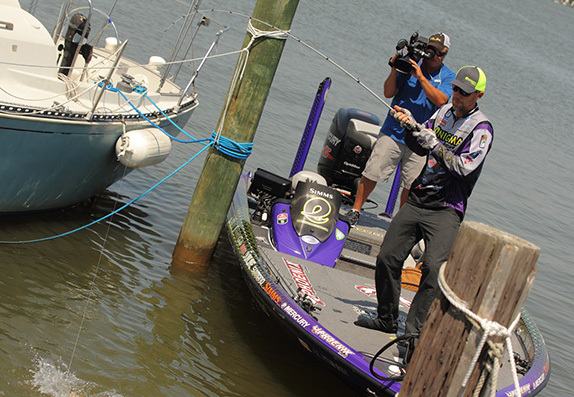 1 position in the latest edition, which takes in the Forrest Wood Cup at Lake Ouachita and the Bassmaster Elite Series events at the Chesapeake Bay and Lake St. Clair. Martens, who wrapped up his second B.A.S.S. Angler of the Year title in 3 years with a 6th-place finish at St. Clair, has a lead of nearly 9 points over previous kingpin Bryan Thrift. Former No. 2 Scott Martin moved down one slot to 3rd and Andy Morgan gained one position and sits in 4th. Edwin Evers, like Martens a two-time winner on the Elite Series this year, jumped 11 places and rounds out the Top 5. The bottom half of the Top 10 consists of Justin Lucas, Jacob Powroznik, Greg Hackney, Jason Christie and Wesley Strader. Martens, now a three-time AOY for his career, has been both consistent and spectacular throughout 2015. He finished among the Top 15 in seven of the eight regular-season Elite events and claimed victories at the Chesapeake and Lake Havasu. Todd Faircloth, a former No. 1 who’d had a lackluster campaign this year before winning at St. Clair, gained 14 places to No. 22. Cup champion Brad Knight moved up 15 slots to No. 42. Chad Pipkens, who logged Top-4 finishes at both the Chesapeake and St. Clair, is up a whopping 65 places to 83rd. The next tournament that will impact the rankings is the Bassmaster AOY Championship (now misnamed due to Martens’ early clinching of the title), set for Sept. 17-20 at Sturgeon Bay in Wisconsin. Aaron Martens slept through his alarm clock Sunday morning, got on the water 30 minutes late and still clinched the 2015 Toyota Bassmaster Angler of the Year title three weeks early. By finishing sixth in the Plano Bassmaster Elite at Lake St. Clair, the 43-year-old Leeds, Ala., angler built an insurmountable 102-point lead over his next closest competitor. It sealed possibly the most dominant season in Elite Series history. And it made the Toyota Angler of the Year Championship on Lake Michigan’s Sturgeon Bay next month a foregone conclusion. Martens was only halfway kidding. There was very little chance anyone was going to catch him, even if it had been mathematically possible, at Sturgeon Bay next month. Now it’s impossible. In the eight-tournament Elite Series season, Martens won twice and finished lower than 15th only once. His one hiccup came in the second tournament of the year when he was 66th at Alabama’s Lake Guntersville. His victories came at Lake Havasu and Chesapeake Bay. He finished second at the Sacramento River/California Delta, third at Sabine River, 13th at the St. Lawrence River, 15th at Kentucky Lake. This marked Martens’ third AOY championship. He previously won in 2005 and 2013. He was fourth in 2014. “It has been an amazing three years,” said Martens, who has won over $2.5 million in his B.A.S.S. career. It was a sign of how diligently Martens has prepared for every tournament day this season that he slept through his alarm clock and several wakeup calls Sunday morning. From working on tackle and preparing his nutrition shakes each evening, Martens has been averaging four hours sleep per night. Exhaustion may have caught up with him before Sunday’s final day on Lake St. Clair. Even spotting the other 11 finalists a half-hour before he got on the water, Martens still moved up in the standings Sunday, starting in 11th place and finishing in sixth. It was just the latest example of how dominant he has been all season. The Gamakatsu G Finesse Treble Hook is thinner, sharper, and stronger than ordinary trebles. In fact, the G Finesse Hook, designed by Bassmaster Elite pro Aaron Martens, redefines both “sharp” and “effective.” Patterned after traditional O’Shaughnessy-style hooks, with an acute angle at the bottom, the G Finesse has a bend that seems to hook and hold fish better than round bend designs. The Hooks feature Tournament Grade Wire and a Nano Smooth Coat finish for the ultimate in hook penetration. During this time of year, fishing can be a lot of fun. I use my electronics all throughout the year, but during this time of year, it is especially important to understand how to use your electronics. I have been having fun using my new Humminbird Onyx units these past few weeks, and they are impressive! With my electronics, I will try to locate baitfish, as the bass will be close by. Baitfish will be located in both clear and dirty water, but I prefer to find them in the clearer water because it’s usually a more productive bite; they can sense or see the lure better in clear water. Once the baitfish is located, I will use a number of different reaction baits to target the bass. The bite is almost always a reaction bite this time of year. Some of my favorite lures to use are hair jigs, swimbaits, spoons, belly-spins, tail-spins, and jigging spoons. As the season turns from winter to pre-spawn, I’ll shift my focus to areas of the body of water that are sheltered from cold fronts. In particular, I am looking for areas that are protected from the cold northern winds. This makes it very easy to eliminate a lot of water. Some of my favorite baits during the pre-spawn are jerk baits, shakey heads, jigs, split shot rigs, and of course the drop shot. I will also always have a Carolina rig ready. During this time of year, almost anything can be effective. It really depends on the body of water, but it is the time when specific lakes or rivers really shine for the patterns they are best known for: for example, Ozark lakes and Wiggle Warts or the California Delta and red crankbaits. There are several things that make early season fishing a lot of fun. Specifically, during this time of year there are a lot less anglers on the water which means a lack of pressure; this allows the fish to behave more naturally. It is also a great time of year to catch big fish. One last thing to keep in mind during the early season—be prepared. Over the last few years, I have been wearing Simms apparel, and I can honestly say I have never been more comfortable on the water during inclement weather. For the best results, I suggest layering a warm base layer with a waterproof outer-layer. Be comfortable, stay safe, and get your 2015 fishing season off to a great start with some early season fishing.